The Government of the Commonwealth of The Bahamas in conjunction with the Bahamas National Trust and the Harvard University Graduate School of Design invite you to a public forum on Tuesday, February 19, 2013. The public forum will take place at the Harry C. Moore Library in The College of The Bahamas. It will feature presentations by The Rt. Hon. Philip 'Brave' Davis, Deputy Prime Minister and Minister of Works and Housing, and a number of local experts and stakeholders in areas relating to resource management, environmental economics, governance, and sociocultural issues. Videos of the conference can be viewed on Harvard GSD's YouTube channel. This forum marks the beginning of a multi-year project titled, "A Sustainable Future for the Exumas: Environmental Management, Design, and Planning." The project extends from collaboration among the Government of The Bahamas, the Bahamas National Trust, and the Harvard University Graduate School of Design. Through a discussion with local stakeholders on the areas critical to the successful completion of the project, the structure of the research is in this forum reflected in four panel themes: Resource Management, Economic Development, Governance, and Socio-cultural Issues. There will be two brief presentations per panel by local experts followed by a discussion moderated by Harvard faculty. We hope the conversation will include a plurality of points of view on the various topics. This forum builds on the conference held in Nassau on 8 July 2011. 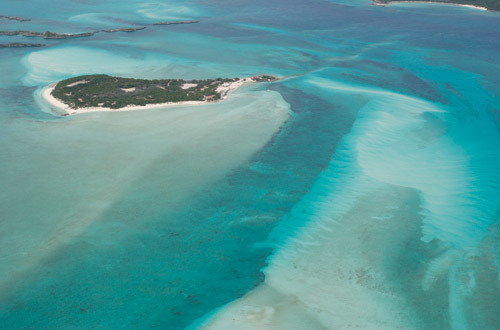 Additional symposia, workshops, and meetings are planned in parallel with extensive field research focused specifically on the Exumas, as well as The Bahamas more generally. The ultimate goal of this project is to develop a series of proposals for designing and planning a more resilient future for the Exumas. 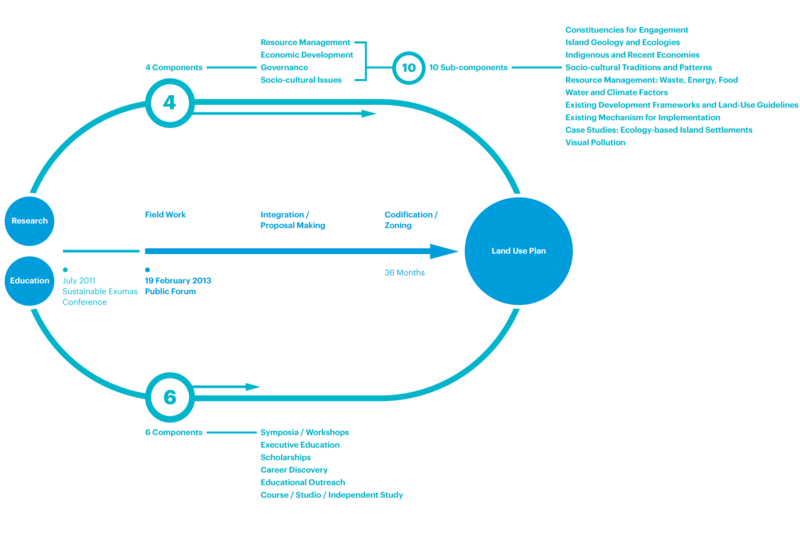 This ambition requires the active participation and advice of various constituencies for engagement, including local residents, private landowners, government and NGOs, as well as temporary residents and tourists. The Bahamas is a flat coastal state which relies heavily on the annual rainfall that the Atlantic hurricane season brings. It is during these events that frequent flooding occurs, but also natural aquifers are recharged. Traditional agricultural practices quickly exhaust the thin and fragile layer of soil. Local food production accounts for only 1.4% of the country's GDP, focusing on vegetable and citrus production for export to the North American market. More than 90% of the nation's food products are imported and the inter-island transport of food from the capital results in an added increase in cost. Island waste disposal and energy production present seemingly intractable problems in terms of sustainability. In the long term, climate change presents a new challenge. Studies suggest that rising atmospheric temperatures will ultimately reduce average rainfall and heighten the intensity of tropical storms. 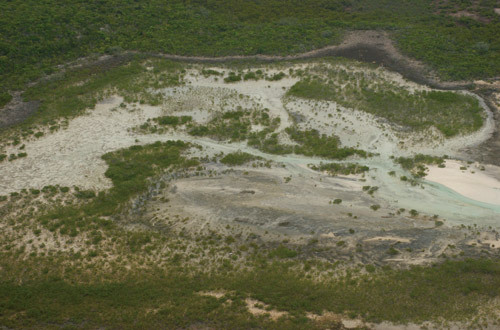 The potential consequences for the Exumas include degradation of marine habitats, loss of freshwater resources due to salt intrusion, the loss of agricultural land, and large-scale coastline erosion. 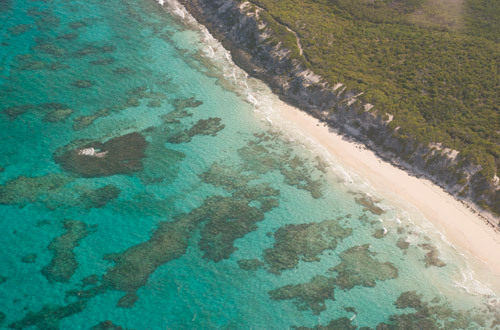 These possible outcomes will not only transform the natural environment, but will also impact all of the social and economic constituencies, including tourist developments and other major infrastructures and settlements on the Exumas. The Exumas are not rich in natural resources, thus, its economy has been strongly dependent on foreign income and trade. During colonial times, The Bahamas thrived upon the business of providing war supplies to the United States, enabling Nassau's population to grow and prosper. 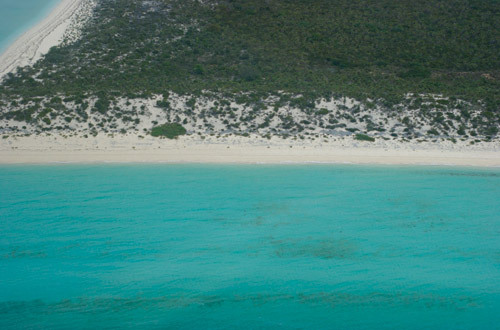 In contrast, the Exumas was mainly settled by Loyalist farmers, who made cotton production successful for a short time. 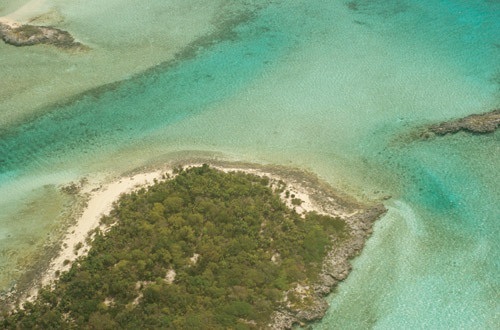 Since then, the Exumas has remained scarcely populated, with economies based on subsistence farming and fishing. 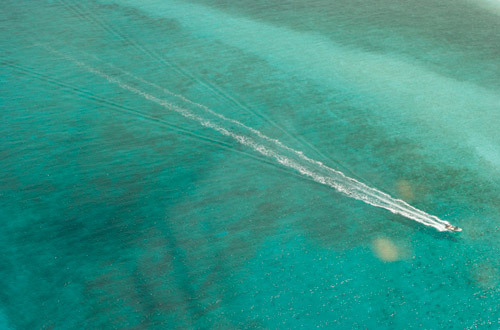 In recent decades, The Bahamas has developed its economy towards financial services and mass tourism. Tourism is now the largest economic contributor, accounting for 50% of the country's GDP. The economy of the Exumas is a contrasting one, where an international population of tourists sits side-by-side with the more traditional economic engines of fishing and agriculture. Each engine looks for ways to diversify and grow with the scarce available resources. 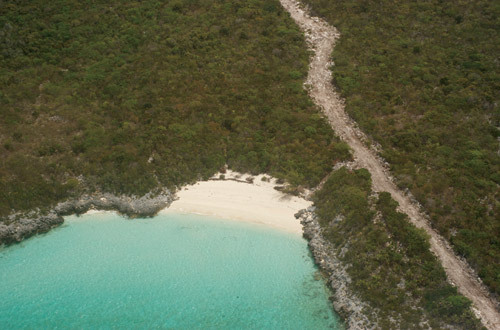 The "no-take zone" of the Exuma Cays National Park adds another layer of complexity. Today, tourism is perhaps seen as an externally oriented activity that sustains the economic fortunes of a few at the cost of environmental sustainability and long-term opportunity for small communities. The Bahamas is organized in two spheres of government-central and local. The Local Government Act of 1996 organized the Family Islands into 32 local governments with the provision of administrators, districts, councilors, and town committees. This act allows local leaders to oversee the affairs of their own districts. Among their responsibilities is the provision of general health care and sanitation, maintenance, cleanliness, road traffic, licensing, and town planning committees. While the central government is adept at creating wide-sweeping plans and policies, it is in the implementation phase where many initiatives present problems related to the nuanced demands of the varying local spheres. Due to diverse population sizes, each district faces completely different conditions. For instance, a highly populated area, like New Providence, with a population of 210,832 (2010 census), requires a different set of processes than sparsely populated places, such as Black Point in the Exumas, with a population of 230 (2010 census). A set of legislative bills and acts, enforcement bodies, and developmental protocols control development and conservation of the Islands. The Town Planning Act (1961) brought into effect Planning and Subdivision Bills, as well as the creation of enforcement bodies such the Town Planning Committee, the Department of Physical Planning, and the Subdivision and Development Appeal Board. 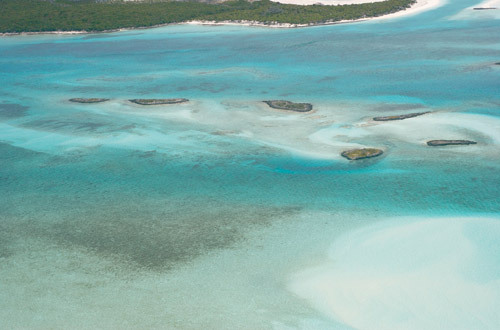 The Exumas is an archipelago of over 365 islands and cays, mostly uninhabited. 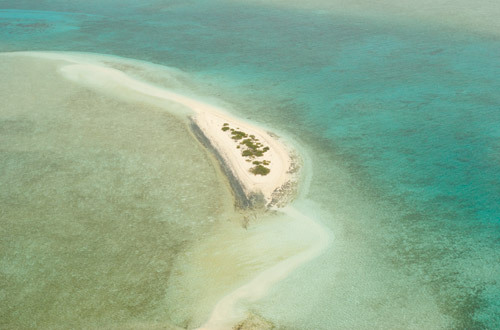 80% of the land area on these islands is one meter or less above sea level. 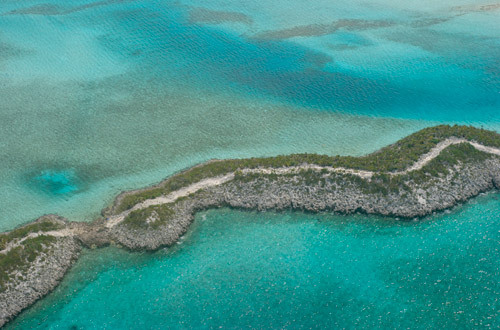 The name "Bahamas" has its origins in the Spanish word "bajamar" (low tide) referring to the shallowness of the sea.  "Exumas" is thought to be the variation of two names with indigenous origins dating back to 1500, Yumey and Suma, which evolved into Cumey and Xuma, as displayed in maps from 1741 and 1804. The cultural identity of the Exumas was influenced by the Spanish and English during colonial times, but was also majorly intertwined with the influx of Loyalists fleeing the United States around 1780. High levels of inequality characterize the islands, juxtaposing wealth and poverty. There is a lack of social inclusion and interaction between socio-economic groups. The Junkanoo festivals on Boxing Day and New Year's Day are important in terms of cultural expression with roots dating back to the times of slavery. Since then, festivals and regattas have been important social traditions in the Exumas where elastic urban spaces become very crowded at specific moments of the year. The Honorable Philip Edward "Brave" Davis is an accomplished attorney, parliamentarian, philanthropist and family man. He is a Senior Partner in the law firm, Davis & Co. and is considered one of the leading advocates in the country. In the recent general elections, he regained his seat as Member of Parliament for Cat Island, Rum Cay and San Salvador. He presently serves as the Deputy Prime Minister of The Commonwealth of The Bahamas, and is the Minister of Works and Urban Development. Committed to bringing about positive change in The Bahamas, Philip Brave Davis is determined to ensure that his story of success becomes a common theme for all Bahamians. Betsy V. Boze is the President of The College of The Bahamas. She previously served as the CEO of Kent State University at Stark and as a Senior Fellow at the American Association of State Colleges and Universities. She earned her Ph.D. in business administration from the University of Arkansas, majoring in marketing, with minors in economics and sociology. Dr. Boze plays a major role in the national higher education system of The Bahamas where she works on higher education policies and alternative revenue streams for public colleges and universities. Neil McKinney is President of the Bahamas National Trust (BNT) and has assisted and supported the BNT for many years. He previously served as the Director and President of the Bahamas Chamber of Commerce, and has also served on the National Advisory Council for Education, the BEST National Climate Change Committee and the Montreal Protocol Steering Committee. An architect and educator, Mohsen Mostafavi is Dean of the Harvard Graduate School of Design and the Alexander and Victoria Wiley Professor of Design. He was formerly the Gale and Ira Drukier Dean of the College of Architecture, Art and Planning at Cornell University. Previously, he was the Chairman of the Architectural Association School of Architecture in London. Dean Mostafavi is an author and editor of many books, including Structure as Space (2006), Ecological Urbanism (2010), Implicate and Explicate (2011), In the Life of Cities, and Instigations (2012). 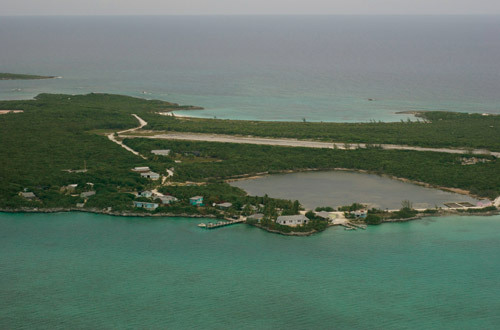 Richard Cant is regarded as an expert on geology and hydrogeology of the Bahamas. He is currently a consultant providing advice and services to the Water and Sewerage Corporation as well as The Government of The Bahamas on geology, water resources, and environmental issues. Dr. Cant also worked with The Bahamas Government as a hydrologist involved with mapping out and quantifying the water resources of all the major Bahamian Islands. He later joined the Water and Sewerage Corporation as an executive and is presently an active member of many national committees that assist government agencies and NGOs on a wide variety of technical matters. Thomasina Wilson is the Senior Deputy Director in the Department of Environmental Health Services with responsibility for all sanitary landfill sites throughout The Bahamas. Wilson is responsible for the coordination of activities related to the Health Inspectorate and Vector Control Division. She has also served as an agricultural officer and successfully implemented a border control unit for the Disease and Insect Surveillance Unit at all Bahamian ports of entry. Wilson completed training and proficiency programs in solid waste management while working with the Inter-American Development Bank Project on Solid Waste. Is Gordon McKay Professor of Environmental Engineering and Professor of City and Regional Planning at Harvard University. Professor Rogers is a member of the Technical Advisory Committee of the Global Water Partnership and recipient of Guggenheim and Twentieth Century Fellowships. His research ranges from the impacts of global change on water resources and the development of indices of environmental quality and sustainable development, to interaction of land use planning and central management. Rogers has carried out extensive field and model studies on population, water and energy resources, focusing on environmental problems in Costa Rica, Pakistan, India, China and the Philippines. Reginald Smith is a native from the Exumas with ten years of service at the Broadcasting Corporation of The Bahamas. Smith was the Administrative Director of the Grand Bahama Island Promotion Board and a Regional Director of Sales and Marketing for Princess Hotels International for sixteen years. He was later involved with high-end real estate sales and currently works on the social development of the island through the Exuma Chamber of Commerce and the Exuma Cancer Society. 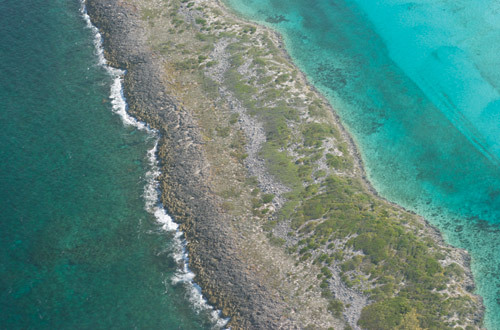 Smith put forward a number of programs designed to rebuild communities by utilizing their unique natural resources to develop a sustainable economic environment for the Exumas. A business and community leader, Franklyn Wilson serves as Chairman of Sunshine Holdings Co. Ltd. and Sunshine Insurance Ltd. Wilson was formerly the Managing Partner of Deloitte & Touche and Chairman of The Council of The College of The Bahamas. He is a member of the Worldwide Board of Junior Achievement, a Trustee of Elmira College and Chairman of The Bahamas Chapter of The World President's Organization. Wilson was honored by The Bahamas Chamber of Commerce as its "Distinguished Citizen in Business" and by Her Majesty, Queen Elizabeth II, for service to the British Commonwealth. Is Associate Professor of Public Policy at Harvard Kennedy School. Professor Hanna is a member of the Evidence for Policy Design research program at the Center for International Development at Harvard University. She is also a research associate with the National Bureau of Economic Research and an affiliate of the Bureau for Research and Economic Analysis of Development. Her research focuses on how to improve the provision of public services and the implications of environmental policy on poor households in developing countries. Hanna's work in this area has ranged from testing models of corruption and bureaucratic absenteeism in the field to understanding how discrimination affects disadvantaged minority groups. Eris Moncur is an educator, an author, and a researcher and has served as both a principal and a superintendent of schools for Cat Island, Rum Cay, and San Salvador. He has presided over several important national cultural events and is currently the chairman of various cultural committees such as the National Insurance Board, The Bahamas Order of Merit Award Committee, the National Advisory Committee on CO-OP, and the National Advisory Committee on Agriculture. Moncur is also the recipient of the National 25th Anniversary National Development Award. Theophilus Cox began his teaching career at the A. F. Adderley Senior High School in Nassau. As an educator, he served ten years in the classroom and twenty years in administration throughout the Commonwealth. His educational background includes a diploma in Youth Work from the University of Guyana, a bachelor's degree from the University of Miami and a masters degree from Andrew University in Berrien Spring, Michigan. In 2002, Cox joined the Department of Local Government as a Family Island Administrator and is presently posted in Exuma. Esther Rolle completed her studies at Penn Foster Career School International in 2010, where she received her certificate in Medical Assistance. She interned at the local clinic in Black Point, Exuma where she had first-hand exposure to the particular needs of the Black Point community. Rolle was the first woman to be elected as a Councilor to the Local Government Board for Black Point in 2009 and again in 2012 where she continues to be an active member in her community. Is Professor of Urbanism and Development at Harvard University Graduate School of Design. Professor Davis's work examines the relation between urbanization and national development, the politics of urban development policy, and conflict cities. She has explored topics such as urban social movements and governance, fragmented sovereignty, and state formation. Her current research focuses on the transformation of cities in the Global South, particularly the social and political conflicts that have emerged in response to globalization, informality and political or economic violence. Davis is an elected member of the Urban and Regional Development Section of the International Sociological Association and serves on the Editorial Boards of several notable journals. Stanley Burnside received his Bachelor's and Master's Degree of Fine Art from the University of Pennsylvania. In 1979, he returned to The Bahamas and became a member of the Saxons and later a founding member of the One Family group. He went on to teach at The College of The Bahamas. He is a co-founder of the collective, Bahamian Creative Artists United for Serious Expression (B-C.A.U.S.E. ), which promotes Bahamian art internationally. Burnside's work remains committed to his belief that Bahamian art is a powerful tool in socio-economic development. Michael Pateman is the Senior Archaeologist for the Antiquities, Monuments and Museum Corporation at The National Museum of The Bahamas. He holds a Ph.D. in Regional Development Planning and a MA in Applied Anthropology/Public Archaeology. Dr. Pateman's research aims to integrate community/indigenous based knowledge and scientific knowledge to develop effective plans and policies for sustainable protection of important cultural/natural resources. His other research interests include pre-Columbian diet, political ecology and heritage management of The Bahamas. Susan Nigra Snyder, a registered architect, and George E. Thomas, Ph.D. are partners in CivicVisions. Ms. Snyder investigates how local identity is expressed, maintained and able to develop while being responsive to larger global and media forces that affect the realms of contemporary life. She has received University of Pennsylvania Research Foundation grants to study forces of consumption on urban form. 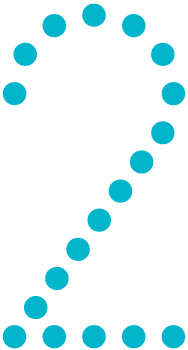 Public service includes serving as chair of Philadelphia Redevelopment Authority’s Advisory Board of Design, a member of the Fine Arts Committee and of the Delaware Valley Smart Growth Alliance jury. Her work has been published in Quaderns Magazine, Modulus, A.D. and Arch+. George E. Thomas, Ph.D., a cultural and architectural historian and Susan Nigra Snyder are partners in CivicVisions. Dr. Thomas has written and lectured widely on nineteenth and early twentieth century American architecture with a focus on the relationship between cultural innovation and architectural design. His teaching seeks to understand the interconnection between history and patterns of modern life. His many books include Cape May: Queen of the Seaside Resort; Drawing Toward Building: American Architectural Graphics 1732-1986; Frank Furness: The Complete Works; William L. Price: From Arts and Crafts to Modern Design; and forthcoming, The Poetry of the Present: Architecture in the age of the great machines. Eric Carey is the Executive Director of the Bahamas National Trust (BNT) and formerly the BNT Director of Parks and Science as well as a Government Wildlife Conservation Officer. Carey is a member of the Bahamas National Wetlands Committee, worked on the BNT Wildlife, Ornithology, and Game Birds committees, was a former board member of the Cape Eleuthera Foundation, and served two terms as President of the Society for the Conservation and Study of Caribbean Birds. His international awards include the Partners-In-Flight International Conservation Award and the Wings Across the Americas Research and Management Partnership Award.